You could easily make this when you come home from work. The curry is extremely tangy, full of flavour and pretty filling, while the chilli and black pepper roti bread are kind of like naan bread – quick to make and great for dipping. For the chilli roti bread, put the flour(s), baking powder, chilli flakes, black pepper and salt in a large bowl. Toss together and make a well in the centre. Pour in 125ml/4fl oz cold water and mix everything together to give a nice soft dough. Knead the dough for 10 minutes by hand or five minutes in a stand mixer fitted with a dough hook and then leave it in a warm place for about 20 minutes. Preheat the oven to 110C/225F/Gas ¼ (fan 80C). Put two large frying pans on the hob over a low to medium heat. Divide the roti dough into four equal pieces and shape each one into a ball. Roll one out on a lightly floured work surface until it is as thin as you can get it to give about an 18cm/7in diameter circle. Dust the top with a little more flour. Drizzle one teaspoon of oil into one pan and pop the dough disc in, leaving it to cook for about two minutes on each side. Meanwhile, quickly roll out the second piece of dough in the same way. Drizzle another teaspoon of oil into the second pan and cook this roti in the same way. Once cooked, fold the roti in half, place on a small baking tray and put in the oven to keep warm. Repeat until all the roti breads are cooked. 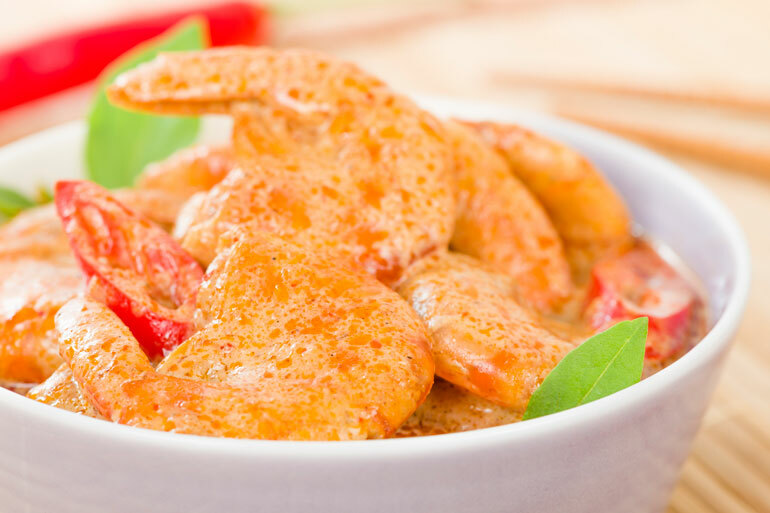 For the prawn, sweet potato and lime curry, put a large pan over a medium heat and toast the coconut for 2-3 minutes, tossing regularly until it turns golden-brown. Tip into a bowl and set aside. Return the pan to a medium heat, add the curry powder and cook for about two minutes or so, tossing regularly, until aromatic. Add the sweet potato, ginger and chilli and stir well. Add the coconut milk and stock and cook stirring for a couple of minutes until it comes to the boil. Turn down the heat and simmer for about 6-8 minutes, or until the sweet potato is almost tender. Add the sugar snap and baby corn and cook for 4-6 minutes, or until tender, stirring occasionally. Mix in the prawns and cook for two minutes, or until they turn from grey to pink. Remove from the heat, throw in the spring onions, squeeze in the lime juice and season to taste. Spoon into serving bowls, scatter the coconut over and serve with the warm roti breads.